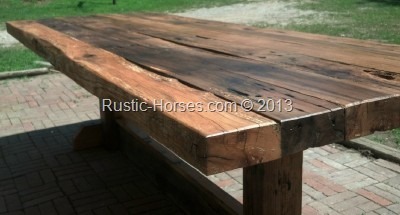 Well they moved the big table out of the shop (barn) to start the finishing process. Coming right along. The customer wants it stained transparent black, so this is the last of it in the natural color. Here it has one coat of clear, next it gets finish sanding and the stain. We prefer to leave them with clear since the wood has such a varied coloring on it’s own but occasionally someone will want a table stained. We aim to please. Are you enjoying these progress reports? I still have yet to come up with a fitting name for this one, it is similar to our Kings table, but is a trestle style base. The base is similar to our Queens table but much more bold and less fancy. Any ideas? King’s Banquet? Big and Bold? King Arthur? Hmm, I will have to get the good camera out and take some real pictures and I am sure a name will come to me.